Harouna’s sons oldest to youngest – Inusah, Iddress, Sadik, Ibrahim, Alhassan, AbdulRahaman, Hamdan, Abdul Hamid, Mohammed, Ahamed, Mahi. Abdoulaye Harouna has been blessed with so many sons to inherit his linguistic skill. He has drums and matching clothes of all sizes, one for every level of the apprenticeship. Sons traditionally stay physically close to home, and their father, whereas daughters marry and move to the groom’s home. The father and sons music compliments existing bonds and serves as a family entrusted with a cultural heritage. Abdoulaye has impressively committed to a well-rounded education for all of his children, so each attend public school, including his oldest child, and only daughter. 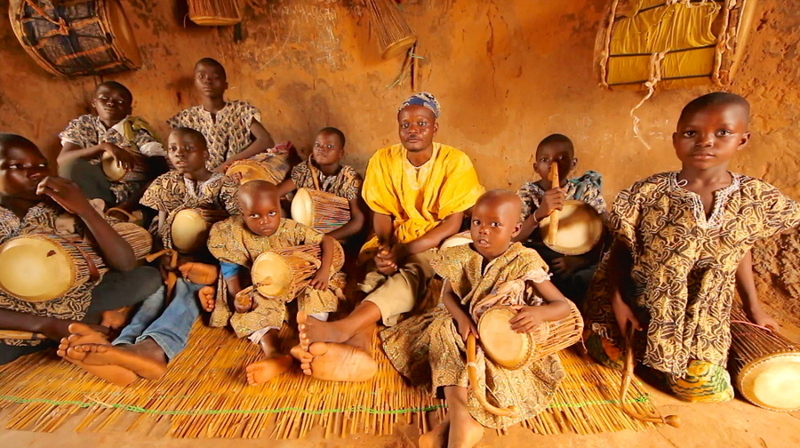 The drastic son to daughter ratio confirms the rare importance of this family’s unique place in Dagomba society. Knowledge of songs for the ancestors links the next generation to long lines of cultural heritage that Abdoulaye has learned over the decades. They now live on the outskirts of Tamale, Northern Ghana’s major city negotiating musical traditions, based on rural customs, from an urban periphery. As both a demonstration of an ensemble and a home rehearsal, father and sons visually represent learning in time through the line-up of their ages, situated on one side of the circular adobe hut. In this home, the hut, traditionally reserved as an open welcome room for guests and the entrance to the home concession with door openings on two sides, also serves as a space dedicated to music. 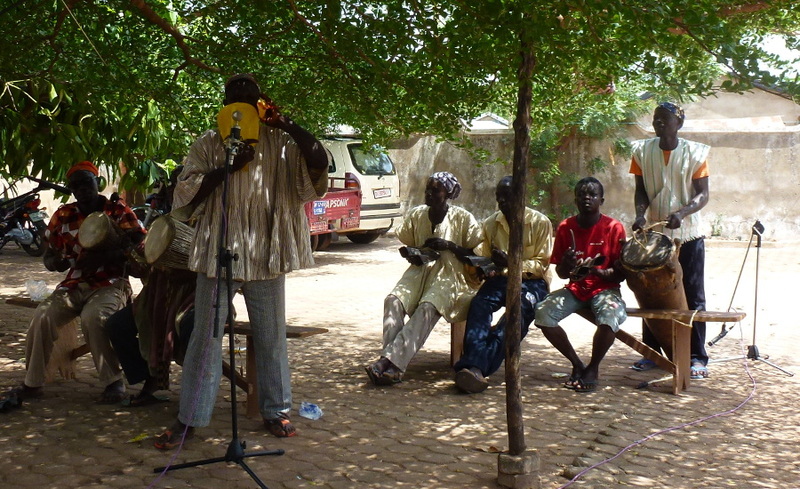 Abdoulaye gathers his sons for a full rendition of one of his many songs to the ancestors. This welcome-room hut has the drum collection hanging from the wall, and serves as an informal and formal practice space, drum-making workshop, and starting and ending point for the older boys that play around town. They leave their home, sometimes after grabbing a dress shirt, stopping to pick up their instruments before heading into town. Then, after hours, the boys return to hang the drums up after an exhausting and exhilarating day in town before retiring into the home’s courtyard. Abdoulaye’s sons play backup for him but also play in groups of four in public around the market. They are often spontaneously commissioned on the street to play for an impromptu celebration so that a group of women in the market can dance and have fun, or to have a party for a group of young women tailors that finished part of their apprenticeship. The boys’ solo voices, for portions of different songs, highlight the difference in sound with a young lead singer, and the attention to correctly pronouncing each word. The boys enjoy the experience of participating in a variety of language contexts, adding to their overall knowledge, with past and present complimenting the construction of a new Dagomba linguistic identity. Dagbanli is their language and they also learn to read and write Dagbanli as well as English in their bilingual school. The boys translated to their father from English and basically arranged everything for these recordings, including the spelling for the songs. Here, oral tradition and formal school meet in some of the firstgenerations of musicians, holders of historic genealogies and musical traditions that can now also read and write in Dagbanli. For his sons, the formal school and apprenticeship rounds out layers of knowledge that interact along various content areas including: oral and written literacy, genealogy, sacred names, heightened vocabulary, annunciation and phrasing, and their different school subjects. The boys also gain practical knowledge involved in knowing the socio-spatial environment of different neighborhoods, streets, markets, languages, and people in an urban setting while maintaining the linguistic standards associated with songs mostly for the ancestors. Abdoulaye sings Dakoli Nye Bi Ba, an elder’s advice to a young man that just had a son. This is a specific socio-cultural situation, different than a man who is married without children, or married only with a daughter or daughters, since father and son have many customs of learning and inheritance. The situation is especially interesting in the context of Abdoulaye with his own young songs backing him up in this song. His singing advises others about their sons having sons, while watching his boys grow closer to the age where he will also find himself in the position of advising his own sons about their sons. The tempo of the songs follows a pace much slower than life, creating the sense of needing to fully engage in listening to the slowly unraveling lyrics. The meticulous annunciation, and spaced out drum strikes, sets a serene tone of careful listening, in a time almost distant from the social reality of everyday life. Abdoulaye almost reveals the words of the lyrics, one-by-one, setting a specific socio-linguistic space for songs of advice and ancestral discourse. Within its musical framework, of dragging, pulsating rhythms and a deliberate, deep, echo of authority, the lyrics also develop a sense of the importance of listening. The lyrical content, and singer-audience relationship, established a relationship that ranges from recitation and towards pleading. The apparent and serious tempo, as well as the focus on the initial consonants of names and words, follows the regal, emotional, and attention-grabbing quality of these songs. 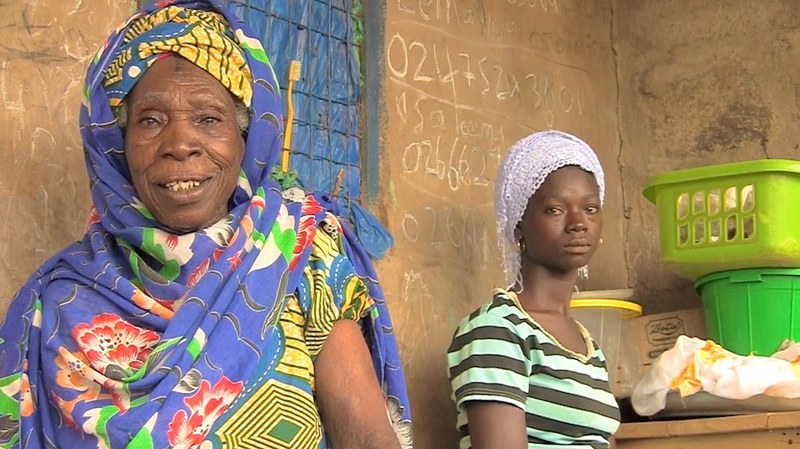 Aissata Nagomse is an elder griot and singer for the main chief in Tamale. She lives just outside of town, in almost a distantly connected, village-like suburb. Close enough to perform major functions at the large palace and at all major cultural events in town, her presence in these settings defines her place as an authority on Dagomba women’s songs. Aissata is a true archive of a variety of genres within the Dagomba female music tradition. She understands royal court responsibilities, social ceremonies, and everyday songs about daily chores, or songs for fun with a group of girls or women. At home, in a casual setting, with a good friend that she likes to sing with, the women join with several younger girls from the neighborhood. Recorded at home, in the casual setting of her porch, just near the edge of town, Aissata schools some young women from the neighborhood with a friend as they perform a collection of women’s songs. These songs are only excerpts. They are usually performed in large groups, when they may continue for extended lengths of time with one song transition into the next without disruption. They include dancing in the middle of the circle when sung for fun at gatherings. Aissata is always warmed up and she pulls the girls along with her lead vocals ready to go for hours. She feels strongly about continuing these traditions and wanted to incorporate the element of the neighborhood girls singing together on the porch to portray the casual feel of the songs and the idea of always pulling up the next generation to learn from a master’s high standards. The lyrics, clapping patterns, pitch, tempo and ululating at the right time are the focus of Aissata’s expert reminders, that may just be a gesture or a glance. Aissata’s repertoire includes praise singing, chief’s court music, and music that women sing while farming, doing housework, celebrating, or relaxing. Her strong, rich voice calls from a deep tradition of skill and lifelong commitment to music and the chief’s palace. Her simple approach and experience with royal and other formal ceremonies and celebrations identifies a multi-functional, professional with a varied repertoire to accompany a wide range of social settings and lyrical styles. Track 1: Praise-singing and –drumming, followed by "Sochendili"
Hear all the tracks at once. The two gentlemen in these recordings are two of the finest and most widely respected musicians of the Dagbamba performance genre called Sapashin-waa. They are each members of a lineage of warriors, called sapashinima, who trace their ancestry to Akan migrants who moved into northern Ghana sometime in the late 18th or early 19th centuries. Buaru is among the most senior and revered sapashini drummers in Tamale and throughout the surrounding village communities. Nakɔha is a praise-singer from the community of Tampion, about 30km northwest of Tamale. He is well-known for his knowledge of history and powerful voice. Buaru and Nakɔha perform a genre of music that is separate from the better-known music of the Dagbamba lunsi drummers (see Harouna Abdoulaye and sons http://alma.matrix.msu.edu/the-language-of-african-music-dagbanli#HarounaAbdoulaye). Like the lunsi, they recount history and praise chiefs, but the topics are typically limited to the deeds of past warriors and sapashini chiefs. The musical ensemble includes the Dagbamba talking drum, called the luŋa, and is augmented by the iron double-bell called dawulε, which is of Akan origin. The warriors’ Akan lineage is also manifested in the use of Akan-Twi proverbs in some of the chiefs’ praise-names. Nakɔha sings the praise of his family ancestry as well as that of great sapashini warriors and chiefs, past and present. Buaru’s drumming both mirrors and extends upon Nakɔha’s texts, adding praises using drum language, rendered as melodic rhythms on the luŋa. The majority of the praising is done through musical settings of "praise-names"—proverbs that are associated with chiefs and their descendants—although portions of the praise-singing are done through prose that recalls historical actors and events. The written texts are transcriptions of interviews with Nakɔha and Buaru, in which they explain the praise-names, proverbs, and some of the historical contexts for their singing and drumming. The interviews were conducted by John Issah and Saeed Alhassan Dawuni, and translated by John Issah. The recordings on this site were taken from a recording session at a studio set up in the courtyard of Muhammed Alidu’s Jisonaayili home, and produced by Karl Haas. The full session features a full Sapashin-waa ensemble which performs several of the most common pieces in the sapashini repertoire. The men who perform in this ensemble typically perform in the retinue of the sapashini chief of Kakpagyili, a community located in the southernmost outskirts of Tamale. They perform frequently throughout the Dagbon traditional area at funerals, wake-keepings, traditional festivals, and the enskinments of chiefs. Karl Haas (Ph.D., Boston University, ’16; M.A. Tufts university, ’07; M.M. 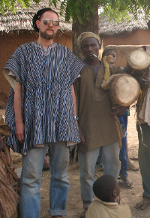 Boston Conservatory, ’02; B.Mus.Ed., Montana State University, ’00) is an ethnomusicologist whose research focuses on traditional performance, gender, and development in urban West Africa. Since 2006, he has been conducting research with the Dagbamba warriors of northern Ghana. His book project, The Warrior’s Blood is Only His Sweat, explores the relationship between performances of traditional music, local preservationist discourses, and the construction of masculinity in the first decades of the 21st century. More recently, Karl has been working on the place of music and dance in Dagbamba youths’ negotiation of tradition-based values and future-oriented narratives of development as they negotiate Africa’s growing "youth crisis."